HTTPNetworkSniffer - Shows HTTP requests/responses sent between the Web browser and the Web server. On Windows 7 with UAC turned on, 'Raw Sockets' method only works when you run WebSiteSniffer with 'Run As Administrator'. Added 'If filename already exists' option: Generate different filename (default), Overwrite the existing file, Don't save the file if it already exists. WebSiteSniffer now automatically loads the new version of WinPCap driver from https://nmap.org/npcap/ if it's installed on your system. When using WinPCap driver , WebSiteSniffer now displays more accurate information in the adapters list of the 'Capture Options' window. WebSiteSniffer now offers you to run it as administrator (Under Windows Vista/7/8 with UAC) if you start to capture using Raw Sockets method. WebSiteSniffer now allows you to automatically add it to the allowed programs list of Windows firewall when starting to capture and remove it when you stop capturing. This option is needed when using the 'Raw Socket' capture method while Windows firewall is turned on, because if WebSiteSniffer is not added to Windows firewall, the incoming traffic is not captured at all. Added option to save and load the entire configuration of WebSiteSniffer ('Save Configuration' and 'Load Configuration' under the File menu). Added 'Load Capture File' option, which allows you to load a capture file created by WinPcap/Wireshark (Requires the WinPcap driver) or a capture file created by Microsoft Network Monitor driver (Requires the Network Monitor driver 3.x). When you use this option, WebSiteSniffer will analyze the packets stored inside the capture file, and then it'll extract all Web site files according to the current 'Capture Options', exactly like it's done with a live capture. Fixed bug: When opening the 'Capture Options' dialog-box after Network Monitor Driver 3.x was previously selected, WebSiteSniffer switched back to Raw Sockets mode. Added new option: Set the modified time of the downloaded files according to the modified time on the Web server. Added 'Start As Hidden' option. When this option and 'Put Icon On Tray' option are turned on, the main window of WebSiteSniffer will be invisible on start. Fixed a crash problem occurred while browsing into some Web pages. Fixed bug: WebSiteSniffer created files with double extension (like image.gifgif) if the MIME type database in the Registry contained extension name without a dot. When downloading a large file with a fast Internet connection, WebSiteSniffer might lose some of the packets, and thus the captured file will be corrupted. If some of the Web site files are taken from the cache of your Web browser, WebSiteSniffer won't be able to capture them. To ensure that all Web site files are captured by WebSiteSniffer, clear the cache of your Web browser, or use the 'Start Private Browsing' option of Firefox. 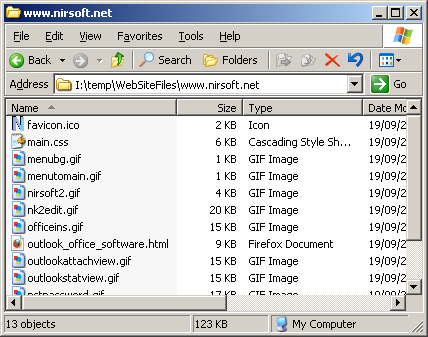 After running WebSiteSniffer in the first time, the 'Capture Options' window appears on the screen, and you're requested to choose the base folder to download and extract all Web site files, the file types that you wish to capture (html, image, video, audio, scripts, and so on...), the capture method, and the desired network adapter. In the next time that you use WebSiteSniffer, it'll automatically start capturing the web site files according to the last selected settings. After clicking the 'Ok' button, WebSiteSniffer starts capturing the network packets on your network adapter. You can simply open your Web browser, browse into any Web site you like, and you'll see the files of the Web site you visit accumulated under the base folder that you chose. 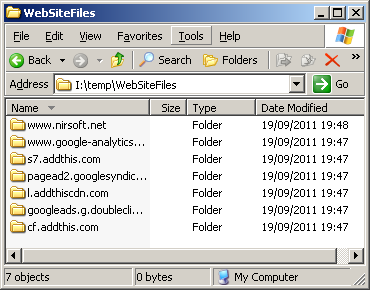 The main window of WebSiteSniffer also displays the statistics about captured files for every Web site. You can also select the desired Web site item and press F8 (Open Web Site Folder) to open the folder of the selected Web site in Windows Explorer, and easily view all files captured from this Web site. A file named WebSiteSniffer_lng.ini will be created in the folder of WebSiteSniffer utility. After you finish the translation, Run WebSiteSniffer, and all translated strings will be loaded from the language file. If you want to run WebSiteSniffer without the translation, simply rename the language file, or move it to another folder. WebSiteSniffer is also available in other languages. In order to change the language of WebSiteSniffer, download the appropriate language zip file, extract the 'websitesniffer_lng.ini', and put it in the same folder that you Installed WebSiteSniffer utility.